Crest of Hoover Dam. Courtesy United States Bureau of Reclamation. When the United States Bureau of Reclamation began its dam building adventure a century ago to trigger a desert empire, no one foresaw just how successfully cities would flourish. But dams don’t last forever — and the engineers who built them knew that. That sentiment should be a wakeup call to people today, says James Powell, author of Dead Pool. Dams have a lifespan of about 50 years. Knowingly or not, Colorado water users have built themselves into a corner by making dams and their benefits the cornerstones of their lifestyles. As dams have aged and dependence on them has grown, the Colorado’s water supply has dropped — in part because of dams. In the face of dam expiration, water managers throughout the Southwest realize the necessity of curbing water use and augmenting supply. Some managers have tapped water from outside the Colorado River basin, and most champion conservation and policies restricting water usage. And restriction is key: Many Westerners haven’t changed their lifestyles despite conspicuous predictions of less and less water. No one event precipitated the difficult position the American West finds itself in, scientists and historians say. The Colorado River Basin’s crisis is the result of a synthesis of flaws. “We are stuck with the historical consequences of our own actions, our hope for a better life, and our delusional belief that natural resources are inexhaustible,” says Daniel Tyler, emeritus professor of history at Colorado State University. But problems extend far beyond basin states’ boundaries. The key to fixing them lies with getting average citizens to recognize that their actions, and the cultures in which they live, directly affect the shape of the river today and their continued ability to use it. Westerners hear about and see the Colorado’s crisis, but observers say that the severity of the issues hasn’t hit hard enough yet to make them change their ways. When Lee Gaglione and his wife, Sally, moved to Grand Junction, Colo., from Cleveland, Ohio, 15 years ago, the view from the airplane shocked him. The contrast between irrigated and non-irrigated land was startling. Grand Junction, a mild-weather home to 60,000 Coloradans, is blessed with water. Living at the confluence of the Colorado and the Gunnison rivers, Grand Junction’s residents often have to venture beyond city limits for signs of the simmering water crisis. “Here where I live, they’ve always had lots of water for irrigation,” says Gaglione, a dentist. The rivers replenish themselves with winter snow trickling down from the mountains. But “snowpack” has been low these last few years. Blue Mesa Reservoir on the Gunnison River, for example, looked like a little pond last year, he says. By the end of 2011 to the end of 2012, the reservoir’s level was reduced by a third . When Gaglione, a fisherman, sees the Colorado River while commuting to work, he says he can’t help but worry about the fish. Water engineers let only enough water out of upstream dams to keep the fish like trout, bass and catfish alive, Gaglione says. Lower water levels have also made boating difficult. “I’ve (fished) at times when there’s been twice as much water as this, and it was still a big challenge,” Gaglione says. Even though rising prices, fishing conditions and public media coverage remind people that they do in fact live in a desert, there’s still water in the river. The water crisis doesn’t seem to have affected the culture of Grand Junction, he says. One hundred miles northeast of Grand Junction lies Carbondale, a ski town on the Roaring Fork River. A tributary of the Colorado, the Roaring Fork is one of the only undammed rivers in North America. It weaves between snow-loving resort towns like Aspen and Snowmass, supporting a vibrant sports culture. It also pours into and out of neighboring farms and ranch communities, including one in which Gaglione owns a small vacation home. A few years ago, the ranch’s water manager told homeowners that they were using only 70 percent of the water they had rights to. The ranch takes river water for ponds, streams and homes, but waterways weren’t big enough to handle all the homeowners’ full share each year. In states that recognize prior appropriation doctrine — the idea of “first in time, first in right” — a few factors determine water rights. Each right can be bought and sold and is defined by the first date the owner used water from a river or stream, the reason for that use and how much water is appropriate or required for that use. At the ranch, it appeared homeowners didn’t need all the water they had rights to. In fact, he says, knowing water is from the Colorado makes him likely to use it. But prior appropriation isn’t the sole legal hurdle in making sure water is used only when it’s needed. The Law of the River has challenged water managers to find creative means of ensuring that their populations receive their “right” — and then some. “Just the fact that our very stretched system continues to operate successfully is testimony to a lot of very conscientious, good people trying to make things work,” says William DeBuys, author of A Great Aridness. Water managers have been able to stave off colossal issues with the Law of the River in part because appropriation doesn’t mean use. This surplus is critical for California, which has depended until recently on taking almost 20 percent more than its share to survive. Much of that so-called “surplus” existed because states didn’t have ways to bring in water. There has never been a shortage, but that doesn’t mean individual states don’t feel their waistbands tightening — especially Nevada. When Congress divided water among the Lower Basin states in 1928, it did so with population in mind. All of Nevada received only 2 percent of the river’s annual flow, enough to support projected growth for the state’s then-population of about 90,000. “When the state’s allocation was assigned, Nevada’s negotiators viewed 300,000 acre-feet as more than reasonable for sparsely populated Southern Nevada,” says Colleen Dwyer of the Boulder Canyon Operations Office, the USBR office responsible for the Lower Basin. Negotiators focused on hydroelectricity instead, she says, securing a third of all electricity produced by the Hoover Dam. Today, Las Vegas alone has a population of about 600,000. The city serves an additional 40 million tourists annually, all looking to relax in fountain-laden hotel plazas and putt through Las Vegas’ 61 desert golf courses. The next smallest “loser,” New Mexico, gets two-and-a-half times as much water for a population three-quarters the size of Nevada’s today. Situated at the crux of three deserts, Las Vegas receives only a few inches of rain each year; if not for resourceful water management, the city would be in a bind. To meet demand, water managers look for ways to make their relatively small amount of river water go further. Southern Nevada decreased its use by more than 100,000 acre-feet between 2002 and 2011, while its population grew by more than 400,000. An issue of semantics means Nevada is able to take 1.7 times its share of water each year through creative accounting. 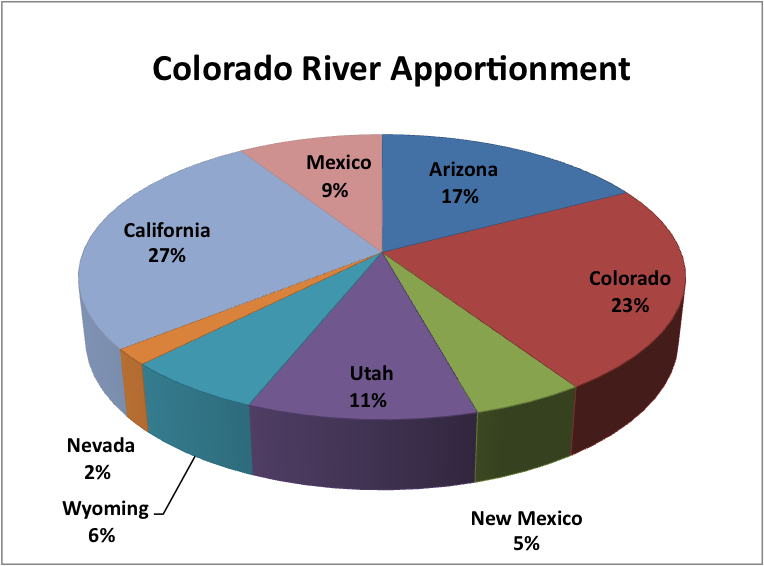 The Colorado River Compact deals only with consumptive use, or water that doesn’t have to be returned to the river as with agriculture; 40 percent of Nevada water use is non-consumptive and ends up back in the river via the sewer system. By cleaning water that goes through the sewer system and returning it to the river, Nevada can “debit” and “credit” water throughout the year. Additionally, Nevada tries to pad its bank account. When requesting water each year, Nevada tells the government it will need more water than it actually will, giving itself a somewhat-imaginary buffer. This tactic ensures the USBR will set aside water in case of emergency because that amount is built into the budget. Even if a state doesn’t need all of its water, Bennett says, it might still request it to head off future problems. But stockpiling loopholes like interstate banking won’t always be around. Eventually, the states will each be able to take as much water as they are allotted, and each will have to recognize that even this much is more than the river can handle. Steve Hvinden of the USBR says the Lower Basin states began taking their full shares in the 1990s, putting pressure on the Upper Basin, and the trend isn’t likely to reverse. Still, changing the Law of the River outside of recent shortage operation plans is out of the question for most policy makers. “My general impression is that the people managing the river, all these water agencies are still hoping somehow this is going to work out, somehow they won’t have to tamper with the Law of the River,” author Powell says. Utah water engineer Robert King says gutting the Law of the River would do more harm than good. Too many other negotiations are based on it, and litigation won’t likely create immediate solutions. “That ignores the reality of 100-plus years of development and planning and use by 30-plus million people that depend upon the current operations of the Colorado River and the current interpretations of it,” he says. Bennett agrees. In fact, he says, he’s seen a shift in water-selfish Western culture over the past 20 years that makes the Law work better: collaboration. Before the drought, Bennett says, he saw basin states as “neighbors that shared a resource but didn’t have a lot of reason to interact with each other.” But with a new reality sinking in, he sees water banks and interstate storage projects as signs that states are willing to support one another. In spite of collaboration, some variables affecting Westerners’ water supplies exist outside of their control — sometimes because of past generations’ actions. No matter how the laws are set, no matter how much water people use, 21st century Westerners will not have as much water going forward as they do today. Dams and canals are inherently flawed; plus, regardless of future technologies humans create, a growing body of science argues that climate change will also cause water stockpiles to evaporate faster. Draining Lake Mead. Courtesy Alicia Pimental. So engineers built lots of dams, but the river can only handle so many. Powell says that 40 million acre-feet is the maximum amount of water that can be held in all Colorado dams while keeping the river sustainable, but Lake Mead is able to hold 28.5 million acre-feet all by itself. Pressure from increasing populations meant that Lake Mead, which took almost seven years to fill while supporting a much smaller population, was already depleted by half in 2007. It will never regain max capacity, which would require storing two years of river flow. Dams aren’t able to function forever, and early dam boosters knew it. One reason, experts say, is dirt. No matter how the laws are set, no matter how much water people use, 21st century Westerners will not have as muh water going forward as they do today. The Colorado is an especially muddy river that flushes dirt and minerals through the basin, making farmland along its banks nutrient-rich. Dams hinder that process, inadvertently caching silt in their floors and further disrupting rivers’ natural processes. The Hoover Dam has lost 2.4 million acre-feet of storage space to silt buildup since 1935. Silt buildup has slowed in Lake Mead recently because Lake Powell, upstream of Lake Mead at Glen Canyon Dam, has captured 95 percent of the silt that would have gone to Lake Mead since 1963. Reservoirs filling with silt place pressure on dams and also limit their ability to produce hydroelectricity. The more silt, the more likely pipes leading to turbines will be blocked. 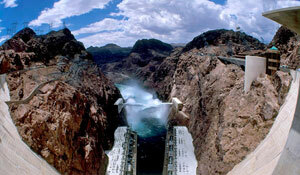 Las Vegas, as it happens, gets 90 percent of its power from the Hoover Dam. According to a 2008 study, there is a 15 percent chance that Lake Mead wouldn’t have enough water to produce any power by 2017. Even for a rich country like the United States, moving this buildup elsewhere would be “prohibitively expensive,” Powell says, and would burden someone else with toxic sediment. And if ever there were a flood, the combined pressures of silt and lack of space might bring down an entire high-hazard dam. Dwyer of the Boulder Canyon Operations Office says the country’s 84,000 dams have an average age of 52. Only one USBR-built dam has failed, but the damage from that single event was immense in lives lost. The USBR spends between $75 million and $85 million repairing its 474 dams and dikes each year. The danger of dams to populations dependent on water is compounded by the fact that their shape contributes to water loss through evaporation. Because dams expose a significant amount of water through surface area, the Hoover Dam alone loses 800,000 acre-feet of water annually — almost three times Nevada’s annual share. This evaporation and a host of other worries will only be aggravated by climate change. Hoover Dam from Above. Courtesy Library of Congress. “Certainly up until two to three years ago, the Bureau of Reclamation was in complete denial about the science of global warming, in denial about anything that would compromise their ability to keep the river more or less the way it is today,” says Powell, who has spent the last few years studying climate change and the politics around it. As with Major John Wesley Powell before him, James Powell — no relation to the river explorer — sees opposition based not on fact but on sentiment. The USBR had been using streamflow records from the past century to schedule water releases and forecast future flow, but recently began using more modern and broadly derived data, showing a willingness to accept new information, Powell says. Crucial data have come from dendrochronological records — that is, tree ring studies reflecting water resources over a span of 500 years. These studies showed that the two decades used to determine average annual streamflow found in the Colorado River Compact really were the wettest decades in half a millennium. Since then, the USBR’s forecasts have been grimmer. This past year, it projected that there will be a 3.2 million acre-foot imbalance between water demand and supply in the basin as a result of climate change 50 years from now. “We have reached an era of limits,” says Steve Hvinden of the Boulder Canyon Operations Office. Of climate change’s many aspects, global warming is one of the most comprehensively damaging. Western temperatures are reaching record highs, making it even harder to keep water in the basins. Utility companies recognize the seriousness of climate change, but some can’t wait for cultural shifts to ensure they will have access to water. In 2009, the Southern Nevada Water Authority began digging a three-mile tunnel beneath Lake Mead to create an intake in the bottom of the reservoir. The company already has two intakes at higher elevations but recognized that water might not reach those points soon. Bennett says he has mixed feelings about the project. “But you can’t afford not to have it, because if we lose our upper intake, our second intake will not be able to produce enough water for Las Vegas,” he says. No matter how the waters of the Colorado are allocated, a bigger issue will be changing how and where that water is used. Entire economies have grown up around dam technology and in the Southwest would not exist without them. The dams themselves have even become an economy. The Colorado River Basin’s controlled flows, reservoirs and canyons support a $26 billion recreation industry. Plus, dams make drinking water, hydroelectricity and food possible. The Colorado River irrigates 15 percent of the country’s farmland, and agriculture draws an overwhelming 78 percent of all river water. Irrigated agriculture in the Imperial Valley alone drinks 3 million acre-feet of water every year – in some part to the benefit of the whole country. Southern California and Arizona supply the nation’s winter vegetables. Harvesting Lettuce in the Imperial Valley, Calif. Courtesy Jonathan Waterman. “Were we to limit agriculture just to the more humid areas of the country, the West would have an excess of water. But we love our agriculture here,” professor Tyler says. Most of the crops grown aren’t the kinds people want to eat. Rather, they are grown to feed what people like to eat, such as cows and pigs. 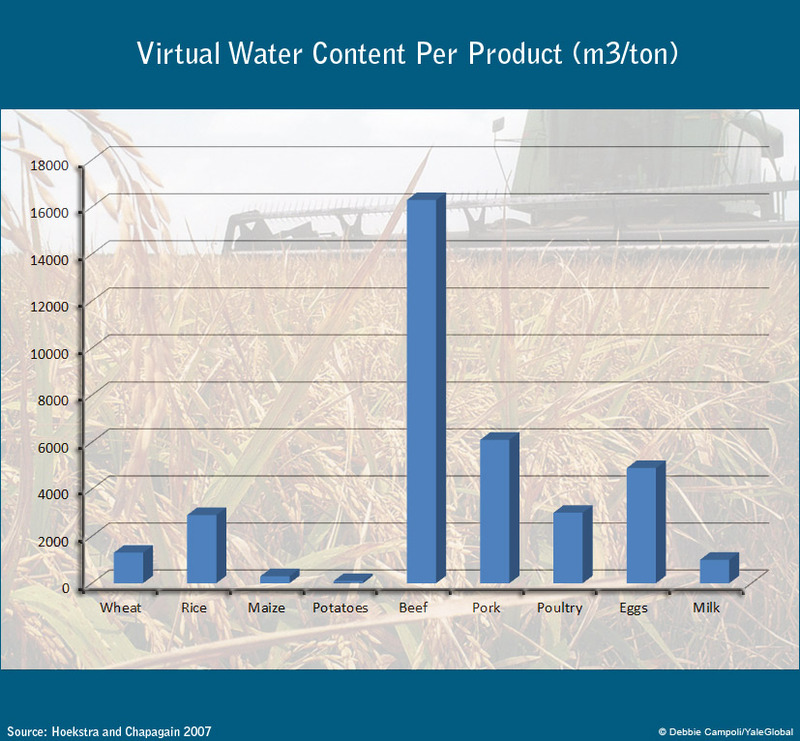 And crops, namely pasture grass, alfalfa and hay, are some of the most water-intensive crops in the country. Kuhn of the Colorado River Water Authority says 90 percent of all crops grown in the West are feed crops, making the cattle they nourish the least water efficient product on the market. Getting farmers to grow crops more immediately useful and more efficient in desert and drought environments – or more in tune with the region’s increasingly earlier spring water cycle – is necessary but wont be easy, Kuhn says. It will take a market intervention to make the region grow more sustainable crops in the long term that can withstand the kinds of drought Westerners now face. As India, China and other markets grow increasingly able to buy pricier protein, Kuhn says, farmers realize they can make more money growing water-intensive feed crops. And the beef farmers, he says, are king. There are 2 million head of cattle in the Colorado River Basin, and their value is only growing. Policies help farmers use water more conservatively, but farm lobbies pushing for certain crops are tough to break. Legislators looking for re-election don’t make changes that negatively affect their economies, and Congress has a history of giving farm subsidies even when farmers can’t always pay them back. Still, author William DeBuys says, the lobbies aren’t impossible to break — though that might not produce great results all around. But if people don’t respect the water and what it can support, conservationists like Weisheit say, the economy will crash. “You can’t make money without water, and if you’re not going to take care of the water, then you’re not going to be able to make money,” he says. Even harder than persuading people to make lifestyle changes, some say, is persuading them to change where they make those choices. Fewer people using Colorado water would lessen pressure on a dwindling supply. It’s even harder to actually tell people to move — or not to come. Getting people to move would first take a USBR admission that its systems can’t support the population, which Weisheit says won’t happen. A Sustainable Las Vegas Lawn. Courtesy Southern Nevada Water Authority. As opposed to limiting populations, says Jim Lochhead of Denver Water, water managers are attempting to limit how people live through water use policies. People respond best to changes in cost, he contends. To better enforce conservation, Denver has created a “Use Only What You Need’” billboard campaign, hired a “running toilet” mascot that shows up at athletic events and festivals, and even created a patrol that calls out big water users and meets with them to talk about conservation in the hopes of changing their behavior. “We use GIS tools so we can literally look at a neighborhood and see who is the high water user,” Lochhead says, noting that the patrol has already met with 4,000 individual customers. Even in Las Vegas, it’s not the golf courses or the casinos that place the greatest pressure on resources, Southern Nevada’s Bennett says. The city has begun paying people to replace their grass lawns with water-resistant stones and shrubs. Bennett says that 50,000 properties, or 10 to 15 percent of properties in Las Vegas, have converted their lawns. Some people, however, aren’t enamored of current conservation policies. Much of the water conserved by taking shorter showers or watering less grass is not technically conserved, Weisheit says. But the real question: With overwhelming scientific support for the fact that the water crisis is real, why is it so hard to get Westerners to buy into conservation? When a problem’s impact is out of sight — like dwindling reservoirs — it’s easier for people to put issues out of mind, experts add. Kuhn notes that a fundamental symptom of this mindset is people not understanding where water comes from. Before Gaglione of Grand Junction moved out West from Cleveland, he had no idea that water was an even an issue there, he says. “In Cleveland, it didn’t matter to us if it didn’t rain a lot or did rain a lot. It wasn’t part of our lives. But here in the West, it’s a big part of everyday life. It takes awhile to figure out that we’re all tied to these natural conditions and don’t necessarily realize it,” he says. Even now, he hears about people conserving water elsewhere but doesn’t feel much pressure to do it himself. Water officials in Utah recently started a public discussion series to engage consumers, engineer King says. If people face the costs of living in a desert, they might feel more responsible for conservation. It took Las Vegans seeing their water source dry up before their eyes, Bennett says, for the city to have a change of heart. Despite all the messages saying the crisis is already here, Gaglione has faith that a solution will appear. But it’s not just ‘the people downstream’ who are responsible, author DeBuys says. U.S. Department of the Interior, (2001). Record of decision: Colorado river interim surplus guidelines- final environmental impact statement.